To reduce the risk of hospitalization for atrial fibrillation (AF) in patients in sinus rhythm with a history of paroxysmal or persistent atrial fibrillation. ≥18yrs: 400mg twice daily (AM & PM) with meals. Permanent AF (normal sinus rhythm will not or cannot be restored). Symptomatic heart failure (HF) with recent decompensation requiring hospitalization or NYHA Class IV HF. 2nd- or 3rd-degree AV block or sick sinus syndrome, unless paced. Bradycardia (<50bpm). Concomitant strong CYP3A inhibitors (eg, ketoconazole, itraconazole, voriconazole, cyclosporine, telithromycin, clarithromycin, nefazodone, ritonavir). Concomitant agents that can cause QTc prolongation (eg, phenothiazines, tricyclics, certain oral macrolide antibiotics, Class I and III antiarrhythmics). Liver or lung toxicity related to previous amiodarone use. QTc Bazett interval ≥500ms. PR interval >280ms. Severe hepatic impairment. Pregnancy (Cat.X) (use effective contraception). Nursing mothers. Increased risk of death, stroke, and heart failure in patients with decompensated heart failure or premanent atrial fibrillation. Increased risk of death, stroke, or HF in decompensated HF or permanent AF. Monitor cardiac rhythm every 3 months during therapy; discontinue or cardiovert if AF is detected. Ensure appropriate antithrombotic therapy before starting. Discontinue if worsening HF develops and requires hospitalization or if pulmonary toxicity is confirmed. Monitor hepatic enzymes during 1st 6 months of therapy; discontinue if hepatic injury develops. Maintain normal serum K+ and Mg2+ levels. Monitor renal function periodically. See Contraindications. Avoid concomitant antiarrhythmics, rifampin, other CYP3A inducers (eg, phenobarbital, carbamazepine, phenytoin, St. John's wort), grapefruit juice. Consider discontinuing digoxin; if continued, reduce digoxin dose by ½, and monitor. Avoid doses >10mg once daily of simvastatin. Reduce dose and monitor Ca+ channel blockers, β-blockers (bradycardia), other CYP2D6 substrates. Verapamil, diltiazem increase dronedarone levels. 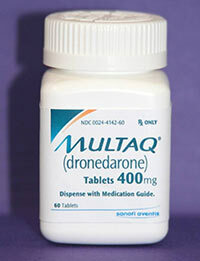 Dronedarone increases verapamil, diltiazem, nifedipine levels. May potentiate dabigatran and other P-gP substrates, some statins, sirolimus, tacrolimus, other narrow-therapeutic range CYP3A substrates: adjust dose and monitor. Monitor other CYP3A or CYP2D6 substrates (eg, SSRIs, tricyclics). Monitor INR with warfarin. Diarrhea, nausea, abdominal pain, vomiting, asthenia; increased serum creatinine, liver injury, QT prolongation, interstitial lung disease, heart failure, hypokalemia, hypomagnesemia. Hepatic (CYP3A); >98% protein bound.